Why is this so poorly planned and promoted? 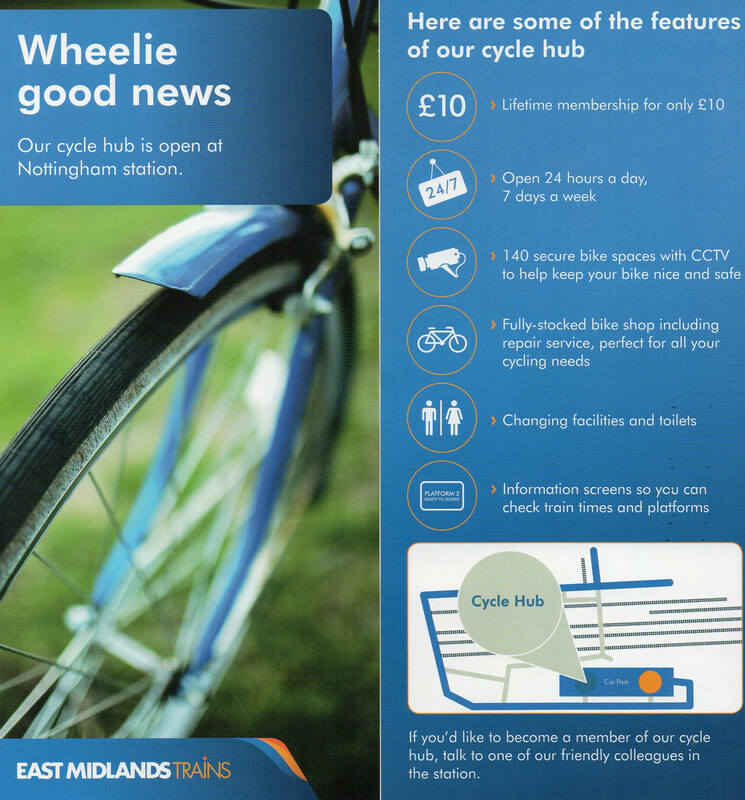 In May East Midlands Trains opened their new Cycle Hub on the south, i.e. Queen’s Road, side of Nottingham Station, but Pedals thinks that this has been very poorly planned and promoted. Very poor cycle access, especially bearing in mind that the already busy Queen’s Road will soon be taking a lot more traffic with the City Council’s plans for next year to divert most through traffic from Collin Street and Canal Street in the Broad Marsh area. Very poor signing of the new facility, by the entrance, within the Station and on the main approach routes. Lack of publicity on how to obtain the fobs to access the facility, on payment of the £10 fee. We therefore arranged a meeting on 19th September to discuss these with Sarah Turner and colleagues from EMT, as well as Keith Morgan from the City Council. Peter Briggs, Hugh McClintock and Paul Abel attended from Pedals, and Adrian Juffs from Ridewise. Comments were also made at the meeting about the poor state of the older Secure Bike Compound on the north (Station Street) side of the Station, opposite Loxley House, and accessible with a Citycard (for free). 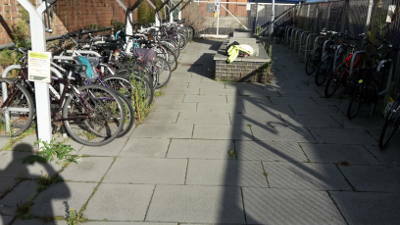 The doors often do not close properly and maintenance has been much neglected, with weeds growing everywhere, and much litter, very much giving the impression that cyclists are a second rate form of station user! As a result of the meeting the following actions were agreed and it was also agreed to meet again in 3 months to review progress. 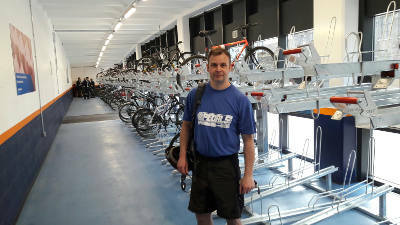 We will also invite Russell, who will soon be taking over a new retail business in the hub (based on his successful experience in running such a facility for EMT at Sheffield station) to a Pedals meeting to discuss its operation, once it is up and running. Electronic doors have not closed properly for the last few months. Entrance area inside the cage is dirty and requires weeding. Keith confirmed that EMT are responsible for the area. EMT do not have access. The older cycle hub on the north (Station Street) side of the Station opposite Loxley House (accessible for free using a Citycard) showing just how much its maintenance has recently been neglected. EMT are supposed to maintain it but claim that the City Council who control it, have not given them keys to do so! The City Council however dispute this view!! Group frustrated at the lack of engagement from EMT in the run up to the hub opening. The entrance is unsafe due to Queens Street road – there is no turning point or dropped kerb for cyclists to safely exit the busy road. 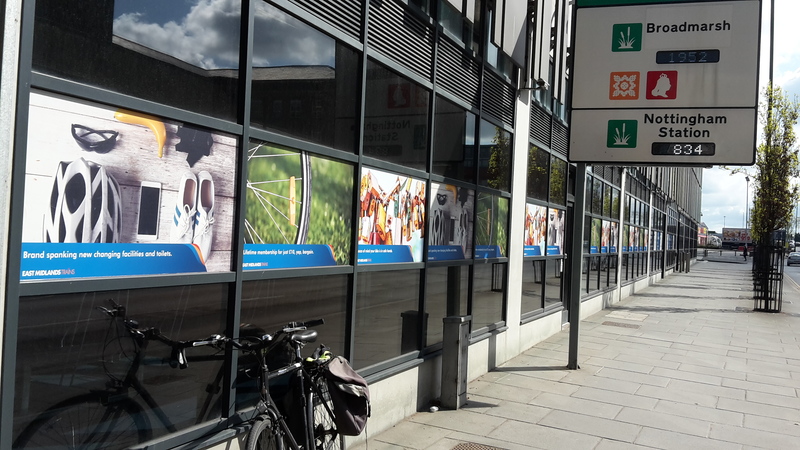 Branding for new cycle hub is poor and entrance area is difficult to see. Window coverings do not make it clear that it is a cycle facility. The entrance is lost and confusing. The top doors do not always work and you cannot gain entry from them. No signage with contact details of whom to report faults or contact if there is a problem. Poor advertising for the facility and confusion of where to purchase a fob from. Facility has been in very poor state of cleanliness. No tools for cyclists – pump etc. There is no instruction how to use the cycle stands and the top stands are too high and dangerous to place your bike. Pedals member Chris Gardner by the 2-level bike racks in the new Queen’s Road Station Cycle Hub. Clearly the upper level racks will be easier for some cyclists to use than others. We have urged EMT to provide posters with clear advice on how to use them and suggested that they also provide video clips on their website. If you can manage to work out how to obtain a fob to access this site (for £10) you can then use them at similar facilities at other EMT Stations including Sheffield and Leicester. EMT will work with the group on the hub to improve and promote the facility. New cycle shop fit out starts next week and Russell should be open for October. Cycle hub has now been placed on the cleaning spec and will be cleaned daily. Marketing campaign will start once the shop opens. Fobs can now be purchased from the ticket office. Racks are used in all of our hubs. We have not received any complaints regarding the top racks.